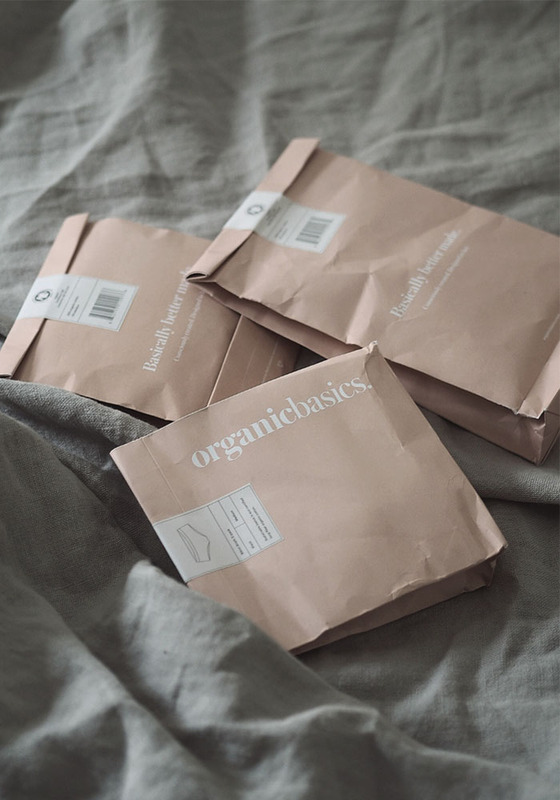 Have you heard of Organic Basics before? It’s a Danish brand created in 2015 which designs and produces sustainable, better made basics. Like me, they think fashion produces too much waste and that there is a better way of doing things, of consuming things and enjoying fashion. In the case of Organic Basics, that means better fabrics and basics like t-shirts, socks and underwear that last longer. It’s a no brainer I think. You can also trust the Danes to come up with some fantastic branding and packaging to deliver the message in style. Isn’t this soft pink packaging gorgeous!? I love the colour so much that I think I’m gonna recycle it and re-use it to store things. With its big white logo on brown padded envelope, the Arket mail order packaging is pretty cool too. I’ve ordered the organic complete pack which includes 2 briefs, 1 pretty triangle bra and 1 basic soft t-shirt. They currently have some Christmas packs for her here and for men here. I had a full on day dealing with paperwork for CASA PYLA and I’m too tired to try them on but I will you soon. In any case, I’m taking them with to New-Zealand. What do you think of the concept? It’s a pretty good idea don’t you think?